Do you ever get the feeling many self-proclaimed Twitter specialists are just big talkers? When you’re just getting started learning about effective Twitter promotion, you’re bound to come across all kinds of failed experts out there. Many of these self-proclaimed social media mavens are actually just parroting clever-sounding ideas they read somewhere. But are they getting results? Because sometimes, all it takes is a little adjustment to your workflow before you start getting traction. Sometimes you’re doing the right things in the wrong way, and sometimes you could simply be missing a part of the digital marketing puzzle. There is much to learn from all the failed Twitter experts out there! So today we’re celebrating diversity and progress with this special visual article. If you spot any expert on this list that reminds you of someone you know, make sure to tag, share and retweet as appropriate! There is simply no way that you can rely on using Twitter bots to grow a respectable Twitter account, these days. Using automated tools for the sole purpose of manipulating Twitter is very unlikely to work as intended, and you will likely face negative repercussions. It doesn’t mean automation doesn’t have a role in effective Twitter promotion! All serious social media professionals use it to some degree, typically by scheduling content in advance. But should you come across a Twitter “expert” who promises easy exponential growth using bots, you will be wise to automatically get out of there. There is no such thing as easy, explosive Twitter growth – unless your account provides real value, of course. If you just focus on getting followers rather than being valuable, you’re bound to become a mere #followbacker. There are many sneaky Twitter users out there who found a clever way to quickly grow a following and create a strong presence: we’re talking about those annoying virtual bums who follow others out of nothing but a desire for reciprocation and a plan for deception. Sure, massively unfollowing people who you recently tricked into following you can sound like a good plan at first… but will this indiscriminate shotgun approach lead to consistent results? Will it allow you to connect with real followers? A little proactivity will take you a long way on Twitter, but only if your account is focused on creating value. It’s one thing to have followers, it’s another thing to keep them – it’s yet another thing to know how to keep them engaged. Speaking of which, let’s see what happens when a typical blogger cares nothing about engaging readers. Sitting on the passive side of the spectrum of Twitter promotion, you have the #boringblogger. These kinds of users absolutely lack promotional insight as they are deeply self-absorbed in their personal magic kingdoms. Since they don’t consider their audience, let alone listen to it… these types of experts often have a hard time growing a presence on social media. The #boringblogger is the kind of person who has no content strategy and no promotional know-how. Much too focused on themselves, these users can’t create meaningful connections and always fail to produce content that strikes a chord. Don’t be that person! You have to create interesting content if you hope to get readers… but just content won’t do the trick… just ask the #contentcreator! Some experts out there are great when it comes to creating excellent content, but struggle when it comes to attracting readers. This kind of user puts a lot of effort into creating genuinely useful articles that typically fail to get any real impact on Twitter – simply because it’s not backed by a solid promotional strategy. Do you know anyone with this kind of highbrow attitude that ultimately fails to get results? Tweet this cartoon and tag them! Those well-meaning (but hopeless) grunts must realize the importance of doing effective promotion work, to really ignite their content. Promotion matters! This is the kind of Twitter user who does succeed in getting a following quickly and somewhat naturally, because they are somewhat influential elsewhere. However… lacking an understanding of Twitter and its dynamics, they are also easily caught up in all kinds of user-generated annoyances and headaches. It goes to show that getting an audience is just the beginning of your Twitter adventure… then you also have to learn how to manage your audience effectively, if you hope to become a true Twitter expert. Or as we like to call it: a true Community Manager. 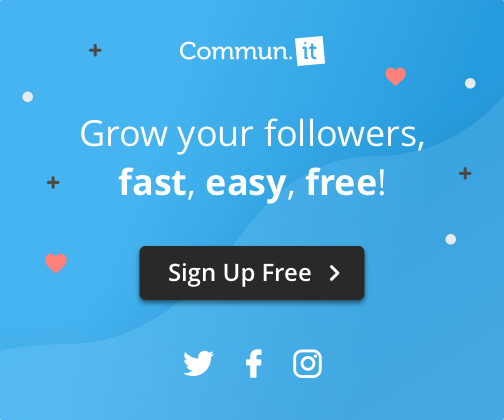 The #communitymanager is the kind of person who doesn’t shy away from using effective tools – but also the kind of user with a solid working understanding of how content flows across the Internet, and how social media promotion really works. Does the Community Manager approach to Twitter promotion get results? Talking from personal experience, we can assure you this is the kind of approach that does work! You must have great content to begin with, but to really get ahead you need an effective promotion strategy and highly consistent work habits. To really get the most from Twitter, you need to be able to fluidly interact with your community and keep up with the latest trends. You can do all of the above with the least possible time and effort by relying on the professional tools available from @Communit! See our website today and learn how we’re improving the lives of Twitter community managers all around the world. Pedro Cardoso is a seasoned content writer joined art classes so he could produce cartoons and visually enticing content. He now splits is efforts evenly between writing and drawing, and he believes comics still have tremendous untapped potential as a contemporary storytelling medium. You can follow him on Twitter https://twitter.com/doso_draws to keep up with his latest creations!